Liven you your next lunch with our Lunch ‘n Play Promotion! 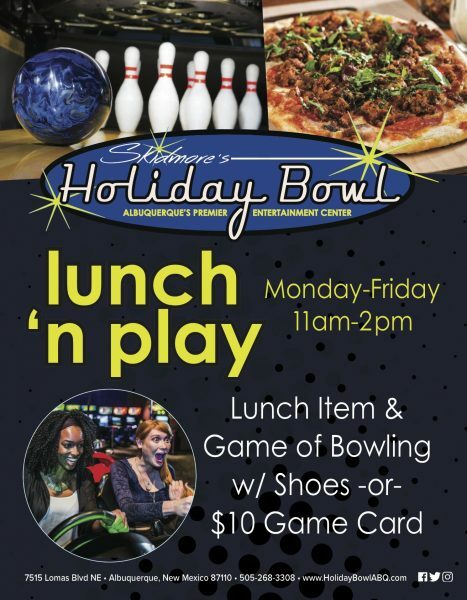 Monday – Friday from 11am – 2pm you’ll receive a $10 Game Card or Game of Bowling for free with your lunch entree purchase. Use your game card in our arcade which features over 50 video and interactive prize games! Here you can accumulate points to redeem prizes from our retail store where we offer a large selection of premium merchandise to win from prize games. Click here to check out our $8 Lunch Menu. © Copyright 2019 Skidmore's Holiday Bowl. All Rights Reserved.